"Thank you so much for all that you did on our big day. The car looked great and it was nice to watch the video and see you treating everybody like absolute Royalty. Thank You." Samantha and Chris - Keyworth, Notts. We Were Never Left In Any Doubt Of The Arrangements. 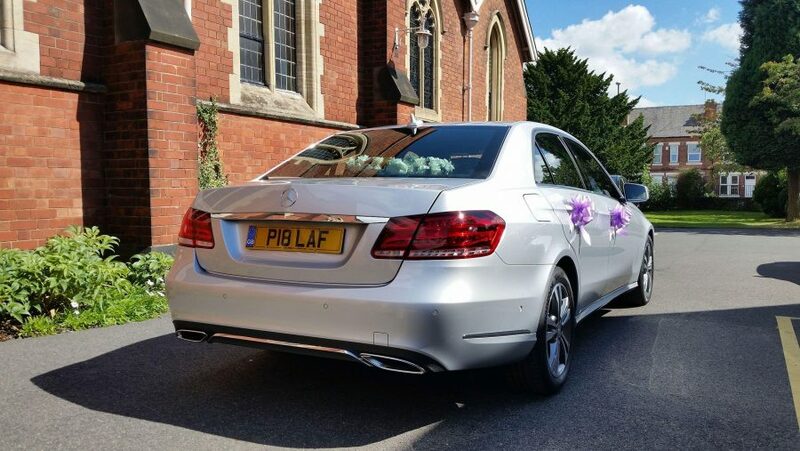 "We found Lafbery's Chauffeuring by just doing a Google search for Wedding Cars in Nottingham and how lucky were we that we found Phil's website! The communication prior to the Wedding was exceptional and we were never left in any doubt of the arrangements. On the day, Phil was always there, with a tissue or a bottle of water and even helped with photos. We would highly recommend Lafbery's, if you are looking for a professional Chauffeur service. Thanks, Phil, for helping our day go so smoothly." Helen Holmes - Gedling, Nottingham. Constant Contact Kept Us Well Informed. 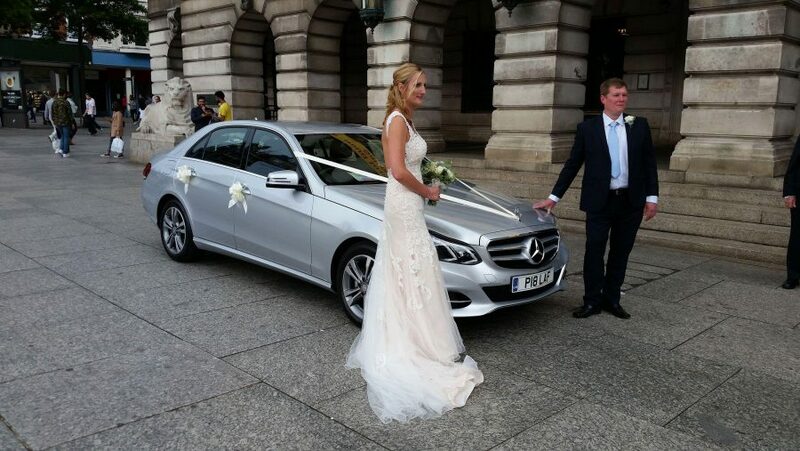 "We were looking for 2 silver Mercedes' for our Wedding day and we found Phil, via his website. When we contacted him he was professional right from the start, keeping in contact with us and answering all our queries promptly. This reassured us right from the start that we had chosen the right supplier for our Wedding Day. On the Big Day he was bang on time and the cars were immaculate. He was smartly dressed and I felt comfortable in his presence. Nothing was too much trouble and he put the car exactly where we wanted it for photos, etc. He even dried the rain off the cars after each little shower! I would definitely recommend using Lafbery's Chauffeuring to anyone. A true professional, who won't disappoint and who deserves recognition for his attention to detail. Thank you so much, Phil." Jo Gambles - Eckington, Sheffield. We travelled in comfort and style and the cars look great in our photos!" The Cars Look Great In Our Photos. 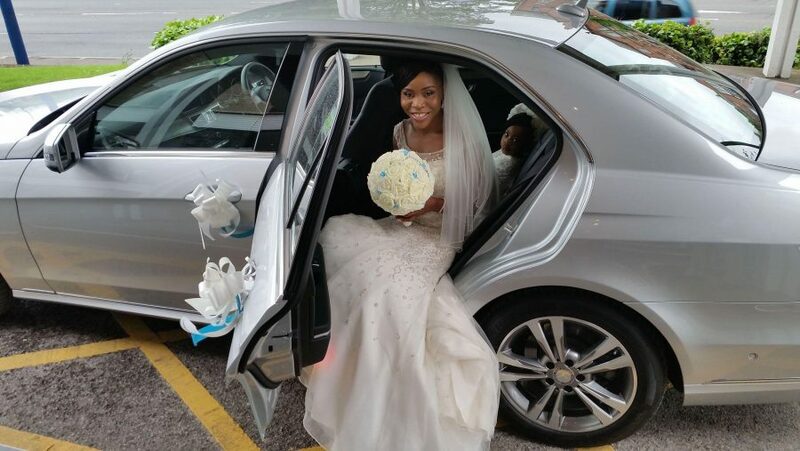 "Thank you so much for the professional job you did with our Wedding Cars. We travelled in comfort and style and the cars look great in our photos!" Clare and Ritchie - Ruddington, Nottingham. After One Phone Call I Was Certain I Had Made The Right Choice. "Phil provided the perfect service for my Wedding. Communication before the event was friendly and informative and I was given a detailed itinerary of what to expect on the day. The customer service was just what I was looking for, and after one phone call with Phil, I was certain I had made the right choice. Phil arrived in perfect time on the day, and the car was spot-on and in excellent condition. The air conditioning came in handy as we were blessed with a hot, sunny day! I wouldn't hesitate to recommend Lafbery's to anyone looking for a quality chauffeuring service." Sheryl Holder - Carlton, Nottingham. Of All The Suppliers I Used For The Wedding, Lafbery's Provided The Best Service. "I used Lafbery's very recently for my Wedding. The level of customer service I received leading up to the wedding was excellent and it was very clear that Phil wanted to do all he could to help me. Of all the suppliers I used for the wedding Lafbery's provided the best service. The service on the day was also brilliant, cars arrived on time and everything went so smoothly. I would highly recommend them to anyone." Fiona Bilton - Hucknall, Nottingham. We Were Very Impressed By The Speedy Response And Friendly Nature. 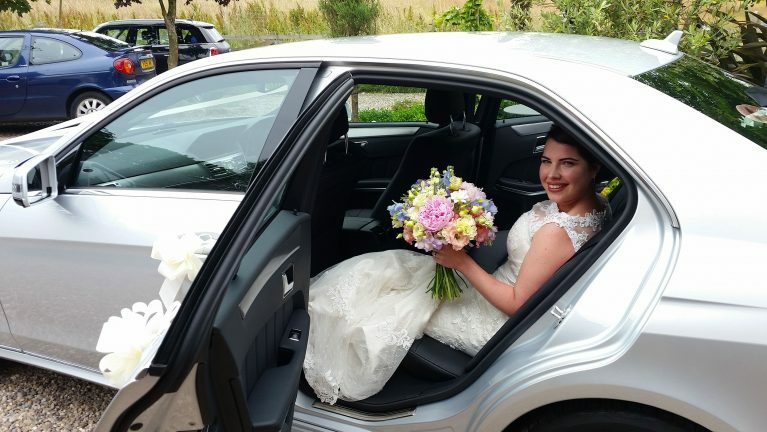 "We chose Lafbery's Chauffeuring for our daughter's Wedding out of Yellow Pages and were very impressed by their speedy response to our emails and friendly nature in sorting out all the details. On the day it was icy and snowing. Phil turned up in plenty of time and was very helpful, put us at ease and helped to make the day very special. The car was excellent. A very professional and friendly service. We would not hesitate in recommending Lafbery's Executive Chauffeuring." Mr. and Mrs. Rothwell - Nottingham. It Was Comforting That You Did A Trial Run The Day Before. "Thank you so much for the professional and excellent service you provided to us on our wedding day in August. It was very comforting that you did a "trial run" the day before and certainly gave us nothing to worry about. The service was fantastic and you took care of our every need from start to finish. The cars were beautiful and were a very important part of our perfect day. Thanks again." Helen and Darren - Gedling, Nottingham. The Friendly Emails Put Us At Ease Right Away. We Had Complete Confidence. "The service was fantastic and the car was beautiful. We really appreciated the personal touches, such as the friendly emails over the last few months which put us at ease with you right away. Nothing was too much trouble. Phil responded promptly, was very friendly and answered all our questions. He kept telling us that this was our day and he would fit in around our plans. It was this attitude that allowed us to have complete confidence in him and it gave us one less thing to worry about. A very efficient and professional service, highly recommendable." Natalie and Chris - Woodsetts, Worksop. You Were Cool, Calm And Collected, Even Though We Had Some Unexpected Hitches! "Thank you so much for the brilliant service that you provided for us for our wedding. You were so cool, calm and collected, even though we had a couple of unexpected hitches! The car was brilliant and looked lovely, and we couldn't have asked for more. Will definitely be recommending you. Thanks again." Claire and Gordon - Woodthorpe, Nottingham. You Were Gracious And Friendly And Accommodated Our Needs Perfectly. "Thank you for the amazing service you gave to us on Saturday. You were gracious, friendly, professional and accommodated our needs and wishes perfectly. I am sure you will be seeing us again." Lyn and Jane - Arnold, Nottingham. Thank You For Turning Up Early. "We had an amazing day and thank you for turning up early. Will recommend your services." Mrs. Cunningham - Weston-on-Trent, Derby. We Never Felt Rushed Or Stressed And The Service Was Excellent In A Very Unobtrusive Way. "Thank you so much for making our day so special. Your car was beautiful and the service exemplary. We didn't feel rushed or stressed and your service was excellent in a very unobtrusive way. We will tell all our friends about you! Thanks again." Victoria and Martin - Redhill, Nottingham. The Service Was 100% And My Daughter And Her Friend Felt Like A Million Dollars! "Lafbery's was exceptional. It was prom night for my daughter and what a night it was, made really special by Lafbery's. The journey was exceptional and comfortable and it was really good knowing that they were taken care of. The service was 100% and my daughter and her friend felt a million dollars! I would recommend Lafbery's every time. Thank you." You Have made Sorting Out The Car One Stress Free Job For Me. "Thank you for all your help. You have made sorting out the car into one stress-free job for me." Rachel R - Gedling, Nottingham. The Price Was Competitive And The Cars Were Very Comfortable. 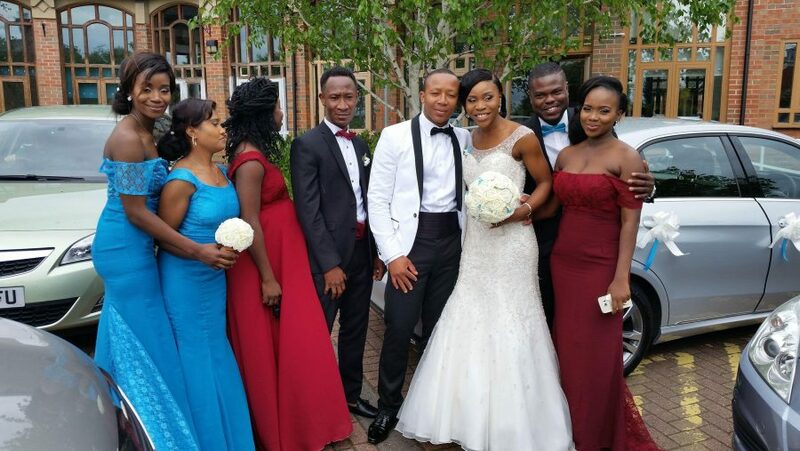 "Thank you very much for the service you provided for our daughter's wedding. We were impressed by your cars and found them very comfortable. We found you to be very competitively priced and would have no hesitation in recommending you. We wish you well in the future. Denise and Barry had a wonderful day. Thanks again." Barbara and David Miller - West Bridgford, Nottingham. We found you to be very competitively priced and would have no hesitation in recommending you. We'd love to add you to our list of happy customers. Call Phil on 07742 195 569 or complete your details below.